1. Why is TM Different? Transcendental Meditation (TM) is a natural, effortless technique practised for 15–20 minutes twice a day sitting comfortably with your eyes closed. During TM your mind settles down to quieter levels of thought and transcends thought to experience a unique state of restful alertness. This state of 'restful alertness' is much deeper than that experienced during sleep and generates significant benefits for your health and well-being. 2. Do I have to clear my mind of thoughts or sit perfectly still? No. TM is a natural, effortless mental technique. Therefore, TM does not require any effort to clear the mind of thoughts. 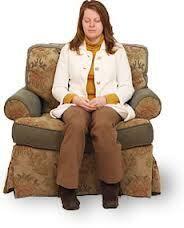 And nor is it necessary to sit perfectly still. This will be a natural result from experiencing the deep relaxation of TM. 3. 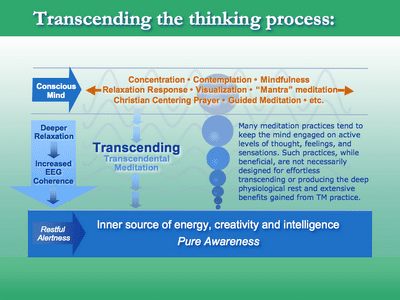 How does TM compare with other forms of meditation? TM is completely effortless. Other systems generally involve either concentration (which means effort) or contemplation (thinking about something). In TM there is no attempt to control the mind in any way or try to achieve a certain result. During TM the mind naturally settles to deeper and deeper levels of rest while remaining alert. Once you have learnt TM from one of our qualified instructors you will know how to start the process and the mind will naturally experience deep rest and inner peace. 4. How do I learn TM? The first step is to attend a free introductory talk, where you will meet a trained teacher, learn about the benefits of TM and ask any questions you may have about learning the technique. Courses in TM are held regularly and instruction requires just an hour or so each day, over four days. You can learn Transcendental Meditation in Sydney, at our centre on Level 9, 47 York Street, in the city. 5. Is there a fee to learn TM? Yes, there is. The fees vary due to your occupation and reduced rates apply for students, pensioners, families and groups. There is a payment plan option for those who wish to spread payment over a few months. 6. Why does TM cost money? TM is a simple, effortless technique taught in a systematic manner, involving 7 key steps plus 4 months of personal follow up. Because of the subtle and profound nature of the technique, qualified teachers spend many hours with each person over 4 months to ensure correct practice and understanding for maximum benefits. 7. How long do I practice TM each day? Typically 15-20 minutes twice a day is all that is needed. TM is usually practiced in the morning and late afternoon or early evening. Your TM instructor will advise you concerning the best time for TM. 8. Where is my nearest TM Centre? To find out more or learn Transcendental Meditation in Sydney, our centre is on Level 9, 47 York Street, in the city. This centre is located just 300 metres from Wynyard railway station and opposite the main bus terminal in York Street. It's easy to spot 47 York St as it's the heritage-listed AWA building with the unique white radio tower on top.